ROMEA o.p.s. in collaboration with the Prague Forum for Romani Histories at the Czech Academy of Sciences‘ Institute for Contemporary History, the Museum of Romani Culture (MRC) and the Romani Studies Seminar at the Faculty of Arts, Charles University has just held the third in their series of public debates on the occasion of the state buying out the pig farm facility in Lety u Písku because of its location on a genocide site. 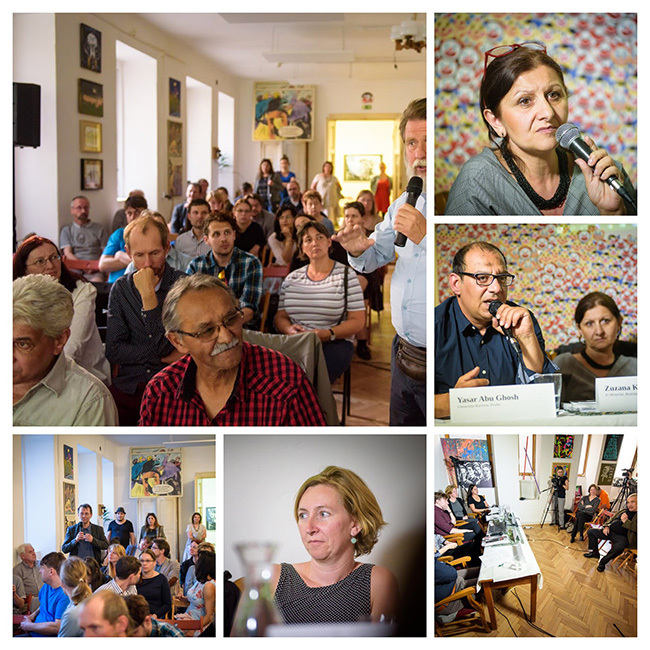 The panel discussion, "Holocaust of the Roma: Contemporary Research in Czechoslovak Context" was attended by almost 60 people and took place in the unique venue that is Kampus Hybernská, a joint project of the City of Prague and the Faculty of Arts, Charles University in Prague. Panelist Yasar Abu Ghosh, a cultural and social anthropologist at the Department of General Anthropology in the Faculty of Humanities, Charles University, has long followed all of the activities around the commemoration ceremonies for the victims of the camp at Lety u Písku and is interested in the example of how this location works with the subject of the Holocaust of the Roma in the public space and in expert discourse. His theoretical contribution about the politics of memory was followed by a presentation by Dušan Slačka, an historian at the MRC who provided absolutely specific examples of such commemoration. Slačka focused his introductory remarks primarily on locales that were not directly persecution sites, but places where Romani people lived until they were forcibly taken to their deaths during the war. "As part of its task as profiled by the Czech Culture Ministry, the MRC produced during 2016 and 2017 a list of memorial sites to the Holocaust of the Roma where we attempted to document existing memorials to the Holocaust of the Roma in Bohemia and Moravia that commemorate the Holocaust and its Romani victims, as well as to monitor the activities attempting to establish new memorials," he said. Using the examples of many such memorials, Slačka demonstrated how they reflect the marginalization of Romani people in society, since Roma are pushed into the background as victims during these acts of commemoration. Non-Romani victims are frequently listed by their full names on these local memorials, followed by all but anonymous, collectively enumerated Romani victims. An illustrative example is the Memorial to the Victims of the First and Second World War in Petrov, Hodonín district, where the list of non-Romani victims‘ names concludes with the statement "... and 34 members of gypsy families." Slačka also showed a photograph of a unique memorial plaque that was created by a completely private initiative in the Nevězice village in the district of Písek, where Mr Václav Luzum installed a memorial plaque on the facade of the house from which his family was taken to their deaths at Auschwitz. Similarly, another private initiative that has not been much noticed by the public involved the family of the Růžičkas from Moravská Třebova, who in 1985 installed a memorial in the village of Bohusoudov in the Jihlava district to honor the memories of the Romani people who were forcibly transported from there to Auschwitz in 1943. During his presentation Slačka emphasized that the phenomenon of commemoration should also be a subject of this research. Ethnographer and historian Zuzana Kumanová of the Bratislava-based association In Minorita then made it possible for those attending to gain some insight into the situation in Slovakia. In expert circles the Romani victims of the Holocaust are still referred to as the "unacknowledged Holocaust" there and few historians are dedicated to investigating the fates of Romani people during Nazism. Commemoration of these victims in public spaces in Slovakia is not yet a matter of course and did not begin to appear until the year 2005 with the Ma bisteren! project. As part of this project the association In Minorita equips public spaces in Slovakia with memorial plaques and monuments to recall the scale of the persecution that Romani people had to face during the era of the Slovak State. For the time being seven such memorials to Romani victims have been installed, one in Banská Bystrica as part of the memorial hall to the Slovak National Uprising and its suppression; one in Slatina in southern Slovakia, where the Romani community was murdered during Christmas in 1944; one in the village of Lutilo, from where in December 1944 more than 40 local Romani residents were deported and subsequently executed in Dolný Turček; one at Hanušovce nad Topľou, where the memorial recalls the labor units to which Romani men were forcibly sent from 1941 to 1943; one in Nemecká, where in the local limestone mine executions took place during the war, including of Romani people; one at Zvolen, in the Jewish cemetery there, where Romani victims of repression are interred in mass graves; and naturally one in Dubnice nad Váhom on the grounds of the local weapons firm ZVS Holding, a.s., where 26 prisoners of the nearby internment camp who had fallen ill were executed. This last remembrance site is not accessible to the public given the security measures in place at the facility, but in order to hold the commemorative ceremony, which took place for the first time at the beginning of March this year on the anniversary of the mass execution, the firm halted its production. When presenting the different states of research and the degree of commemoration of the Nazi persecution of Romani people in the Protectorate as compared to the Slovak State it was not possible to avoid the question of why these differences exist. Helena Sadílková, head of the Romani Studies Seminar at the Faculty of Arts, Charles University, said that: "On the territory of the Czech lands there historically existed a group of Romani people who were aware of the importance of what had happened and the significance of commemoration, which also inspired research. Dušan [Slačka] and I are investigating the texts authored by Romani people involved with previous attempts at participation and self-organization [for a publication that will be soon released by the MRC entitled "So That You Count On Us Too: Politico-social engagement of Roma and their efforts to establish a Romani organization in postwar Czechoslovakia" - the author]. There it is evident that in almost all the letters the fate of Romani people during the Second World War is mentioned. Naturally this is ideological, because at that time it was part of the discourse, but at the same time it is apparent from the formulations used that these people were actually personally interested in commemorating these events. That is what generates interest in research. In Slovakia I think such interest has been, to a certain degree, on a much smaller scale. Maybe this is connected with the fragmented nature of the different fates of Romani people in the various regions and basically the much longer-lasting process of persecution that did eventually, naturally, in some cases, culminate in their murder, but the vast majority of Romani people in Slovakia did survive that period. The drastic events on the territory of the Protectorate may also have been a stimulus for why the commemoration there is so terribly strong." At the same time, when reflecting on the current different states of remembrance in the Czech Republic and Slovakia, it was suggested that paradoxically the subject of the Holocaust of the Roma has been disseminated in the Czech public space by the scandal of the pig farm on the site of the former camp at Lety. Yasar Abu Ghosh considers the positive influence of that scandal to be unavoidable: "The fact that this became political is due to the circumstance that the persecution was being discussed in the public arena, and it also offers us a way of acknowledging, for example, the political initiatives that have arisen from Romani people in this respect. It has also been a platform for establishing transnational contacts among political actors." Contemporary research: The history of the Roma without Roma? In the final presentation on the panel, Sadílková summarized the institutions and projects in the Czech Republic dedicated to the history of Romani people in the 20th century with an accent on the WWII period. She noted the work of the MRC, which has been dedicated to researching the Holocaust of the Roma since its inception and is also an institution that has historically contributed primarily to assisting such efforts. In Czech society, the subject of the involvement of Romani people themselves in this context has great resonance, as does the concern that the history of Romani people not be written without their involvement. Sadílková noted that: "A basic matter is making use of the testimony from eyewitnesses, concentrating on the perspectives of individual families and people, and preferring that perspective to the perspective of the persecutors and the state. That is an essential point regarding how we can develop an awareness of the breadth of impact that the events of the Second World War had, the roots of those events, and their repercussions for today – and we are constantly reviewing how we can work toward comprehension of those events." During the evening many blank spots in the existing research were mentioned, and not just about the Holocaust and its Romani victims. In relation to Lety u Písku, Slačka announced the MRC’s plans as follows: "A big subject that is momentarily very important is where exactly all that persecution happened. Currently this is primarily about Lety u Písku, where we would like to go into the local community and accumulate the information that has been handed down in family histories locally about what happened at the camp, what the relationship was of the local population to the facility when it was functioning, and what fate befell the site after 1943 when the camp was razed and its inmates were transported to Auschwitz Birkenau. What was the context of the inception and construction of the pig farm?" Gwendolyn Albert then spoke from the audience to remind those assembled that it is not just the creation of the industrial pig farm that greatly needs to be investigated, but also the phase of its subsequent privatization. The optimism about defining these blank spots in researching the history of Romani people, which historians can now come to grips with so the information can be popularized, was then somewhat dampened by Yasar Abu Ghosh, who noted that: "What facilitates the communication of historical awareness is not just that we accumulate this knowledge, but the creation of a space in which different perspectives on history can confront each other, exactly like a classroom in which there can be different views on the course of history.“ He went on to point out that as long as children in the Czech Republic are educated in segregated schools, even the fact that they learn about the Holocaust and its Romani victims will not move their understanding forward. That same appeal to change the climate in Czech society was made by the former Vice Prime Minister Karel Schwarzenberg, who supported the discussion by attending it. On the subject of researching the Holocaust and its Romani victims, he said: "The most important thing would be for the findings of such research to become part of the awareness of the broader public, because to tell you the truth, antigypsyist sentiment continues to be very strong in our country. We must do something to combat this. We cannot revive the dead, but we must do something so that this horrible tradition does not continue any longer. Here I see a lack of activities educating youth about this. Historical experience is not handed down from one generation to the next, but prejudices are, and they last a long time." In addition, Schwarzenberg reminded those assembled that Czech society should acknowledge its own crimes and reflect on them, stating that specifically at Lety there is no doubt that what happened is a matter of Czech responsiblity. The discussion was organized as an auxiliary program to an exhibition by the architect and artist Zdeněk Daniel, “My Black-and-White Shadows: Memento Mori”, currently on display at Kampus Hybernská until 29 May.